The finale of Aunt Jane and Ian’s adventure in the UK. As we approached the end of our week in Scotland, and after our Highland Fling, Ian and I had only one other major destination outside of Edinburgh, and that was Glasgow. An easy train ride from Haymarket station (E-burgh’s other train station, a few minutes closer to our flat), and we arrived in Glasgow in under an hour. Glasgow is very much a real, working city. While there is plenty to see and do, there is a lot of actual commerce and real-life city stuff going on. Charles Rennie Mackintosh (C.R.M.) 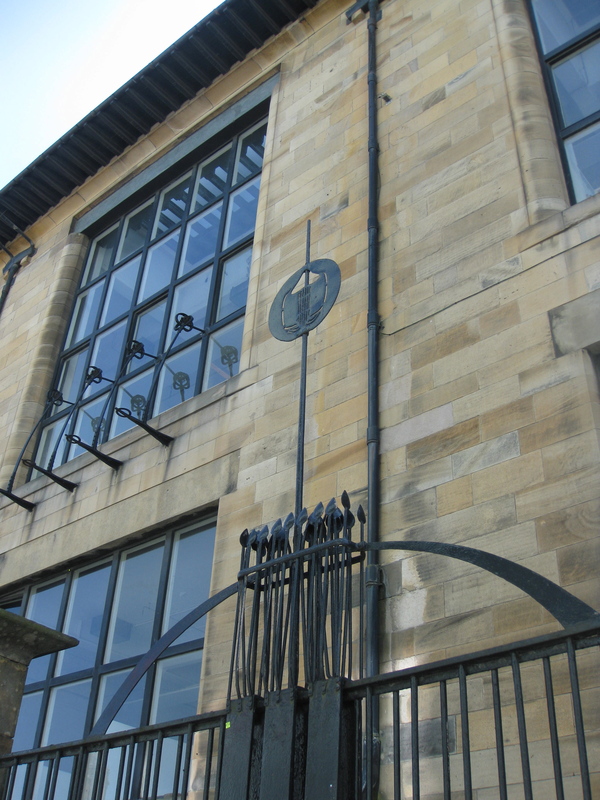 had a major influence on Glasgow design and architecture and we planned to visit the Glasgow School of Art, which he designed, as well as, the Lighthouse, the former offices of the Glasgow Herald and now the Glasgow Centre for Design and Architecture. The Commonwealth Games were also kicking off in Edinburgh the night of our visit. They used to be known as the British Empire Games, but were given a more politically friendly name in the ’60s and are like the Olympics — held every four years — except there’s some non-Olympic stuff like billiards, canoeing, and lawn bowls, that they sneak in. 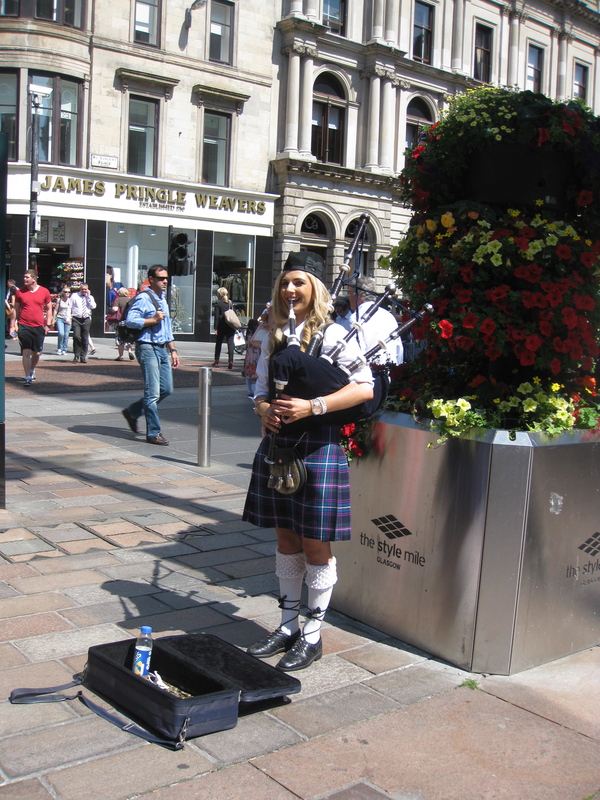 We wouldn’t be in Glasgow in time for any major events, but there was a lot activity and crowds. Anyway, our first stop was The Lighthouse, which had a great exhibit about C.R.M.’s life and work. Despite being poo-pooed by (alleged) Rick Steves’ guidebook (further evidence that we believe it was written by an impostor, Mick Steephs), there were some decent exhibits at The Lighthouse, including one about the sustainable housing constructed for the Commonwealth Games. After all, I’m sure any self-respecting lawn bowler demands sustainable housing. 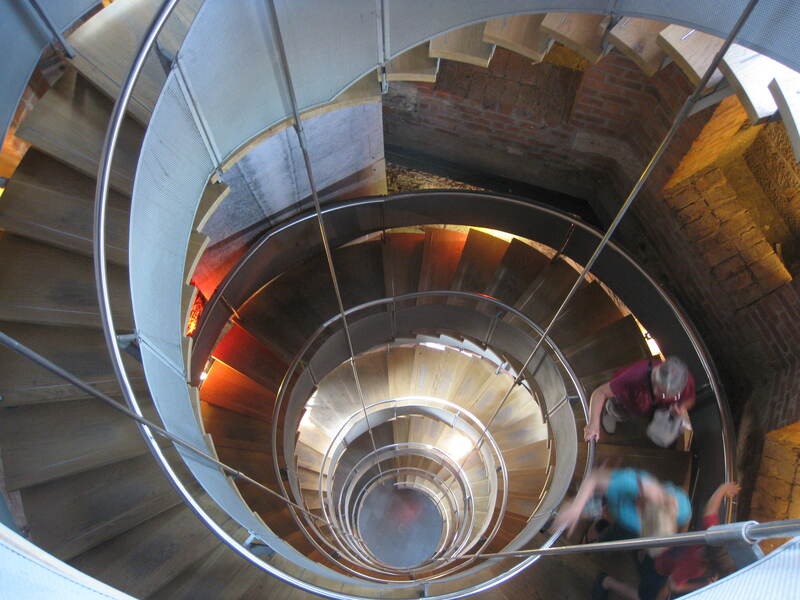 A key feature of The Lighthouse is the six-story tower, not unlike a lighthouse, that you can climb to the top of and get great views of the city, which, of course we did. 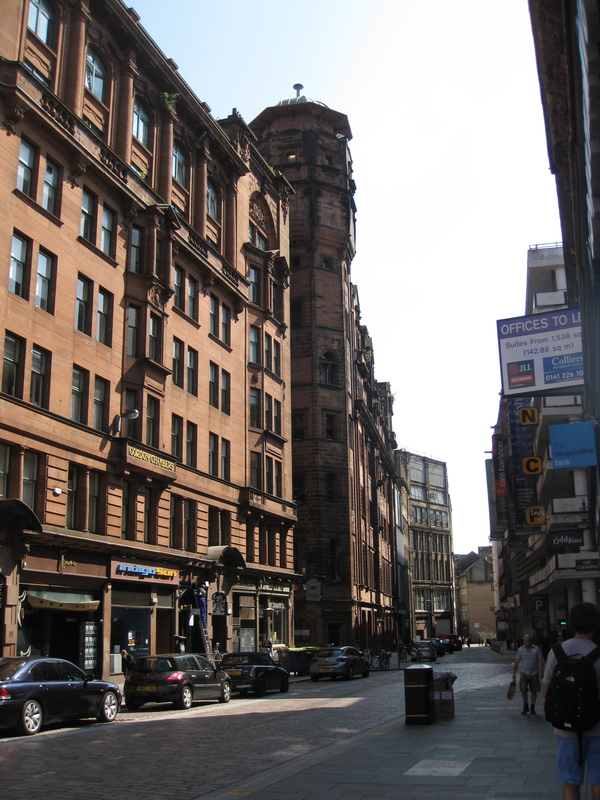 We then decided we’d follow Mick Steephs self-guided walking tour, which was total crap. I’ve decided I’m going to mark up the book and send it to Rick Steve’s to let him know that (1) someone is publishing false material under his name and (2) supply him with some accurate information if he ever decides to write a decent guide of Edinburgh. We finally arrived at the Glasgow School of Art and discovered that there had been a terrible fire there a few weeks ago. It destroyed the library, but firefighters were able to spare most of the original structure. However, because it is a working art school and it was nearing year-end, many students were preparing for their final shows. Many of them lost their year’s work in the fire, which is also tragic. Obviously, visiting the school was not an option. A full restoration is planned. This is also, obviously, not the time to ask why we didn’t check the Glasgow School of Art website before visiting. That would have been too easy. 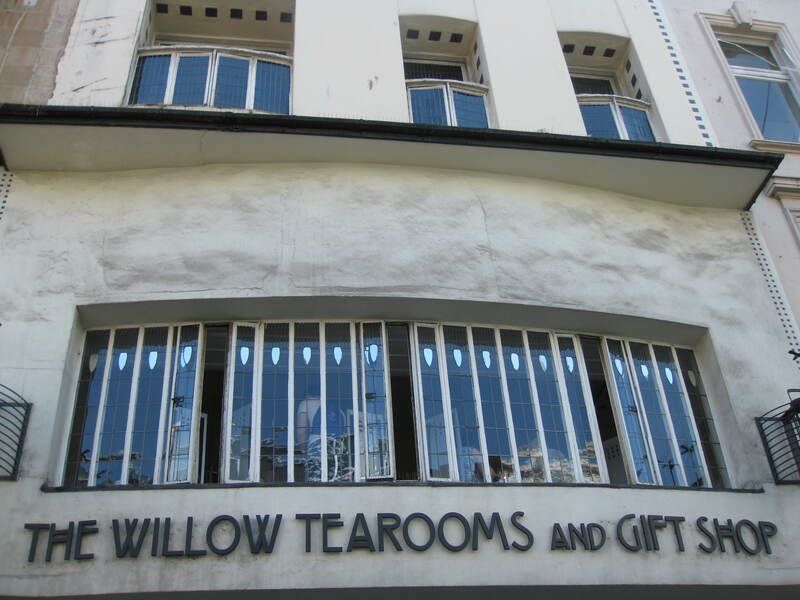 We did get a chance to visit the Willow Tea Rooms, another C.R.M. site that is still in operation today. Designed to provide women with a respectable place to socialize and dine out, the Tea Rooms are still in operation today as a going concern. After a visit to the shopping and restaurant district in the West End of Glasgow (kind of a snoozer), we returned to Edinburgh in time for a late dinner. All in all, another good day in Scotland. Thursday was our last full day in Edinburgh and it began fairly overcast. No matter, we had shopping to do. As you can imagine, the town is full of shops selling a wide variety of woolen items — from a very cheesy full kilt, jacket and sporran (little purse) for £99.99 to very high end cashmere and tweed jackets. The benefit of being here a week, we’d already scoped out what we thought would be suitable gifts for our loved ones back home. 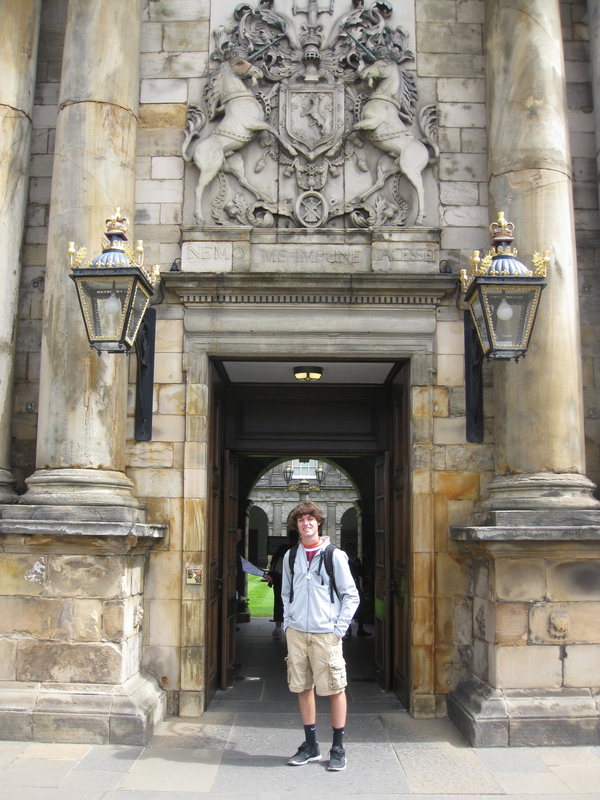 Taking a break from shopping, we visited the Palace of Holyrood House (again). First, we wanted to make sure that Chuck and Horseface picked up after themselves (they did a pretty good job), and then we also wanted to visit the palace. Again, this was a site that Mick Steephs rated much lower than other historical sites in Edinburgh. False. Holyrood House is excellent and played a very pivotal role in British history. Shame on Mick Steephs for dissing it. We enjoyed our tour very much. Tour over, and resuming our shopping duties, we knew “some people” on our list would expect special scotch whisky, so we made a trip to Cadenhead‘s, which is actually a bottling shop. What that means is that they buy casks of single malt scotch and then bottle and sell it to customers. This is a concept completely foreign, I think, to most ‘mericans, but I’d read about the shop (even mentioned by Mick Steephs), so we knew we had to give it a try. Upon entering the store, the first thing we noticed, was that it was tiny. It’s really just one small room. In front of us were a display of half full bottles of Scotches, and a sign that said “For display and tastes only.” Tastes? Okay! To our right, three people sat around a table made from an empty barrel, which was in front of a large chalkboard listing about 100 different distilleries. Behind a counter on our left was a gentleman of unknown age who was busy filling small bottles (20 cl) from 5 casks stacked up against the wall. He wore a wool cap, underneath which long curly hair cascaded just below his shoulders. He looked like a hippie hobbit. “Can I help ye?” he half-shouted at us. I replied, “Well, yes, but I’m not quite sure how this works.” That was clearly the wrong answer. I got a major eye roll and then he exhaled loudly. “I wish you were here 10 minutes earlier when I was explaining it all to this gent,” he pointed to the guy at the barrel table. “But, just so you know, despite what you may have read [he could only be referring to the scoundrel, Mick Steephs] we don’t do tastings. This isn’t a tasting bar. You can’t buy a round of of drinks. I’m not licensed for that. And by the way, if you are actually interested in buying anything, I need to see his ID first,” he said, pointing at Ian. “I don’t know who you are,” he now addressed me, “his mother or something, I assume” He turned back to Ian, “But with that baby-face, I need to check his ID.” I think he was trying to intimidate us. Clearly, the Scottish Jerry Garcia in front of us wasn’t aware that he was dealing with descendants of Clan Grant and our motto is “Stand Fast!” We were there to buy some genuine scotch whisky and no curly headed, surly, Gaelic Oscar the Grouch Muppet was going to deter us. Ian flashed his U.S. of A. Passport at him and he mumbled something and went back to his business. Jerry/Oscar/Bilbo finally finished with his customer and then turned to us, “Well, then. Tell me what you like,” said the spider to the two flies. We were candid about our relative inexperience with the various whisky regions of Scotland, and mentioned we’d been to the Whisky Experience the day before, and were more drawn toward the Speyside and Highland varietals rather than the smoky, peaty Islay single malts. Scot Jerry shook his curls in disdain. “Oh, the Whisky Experience. I’m going to use a bad analogy here,” this would be how he would begin many sentences in the next 25 minutes. “I guess the Whisky Experience is a kind of necessary evil. It serves a certain purpose, for the novice Scotch drinker, but I like to think of it as the Death Star and we are the Millennium Falcon.” Ian seemed to follow this, but I had no idea what he was talking about. Jerry then began to re-educate us about Scotch Whisky and how it is produced, and how they work with the distilleries. As I said earlier, Cadenhead’s is an independent bottler of spirits. They buy casks of spirits from the producers — whisky, rum, gin — and bottle it for clients. In the storefront, they literally had five casks of whisky from different regions that Scottish Jerry Garcia bottled for us right in front of our eyes (we bought a small sampling of three whiskys). The chalkboard I mentioned earlier listed all the other whiskies from each of the other distilleries they had in stock that one could buy. We asked enough questions and demonstrated enough mastery of the topic, that by the time we left, Scotch Jerry was clapping Ian on the back and telling us to “like” Cadenhead’s on Facebook and keep trying single malts. If you are in Edinburgh, it’s definitely worth a visit. Finally it was time for lunch. Despite our ever increasing disdain for Mick Steephs, we chose a pub, The Land’s End, recommended in his mis-Guide to Edinburgh and finally tried some haggis. 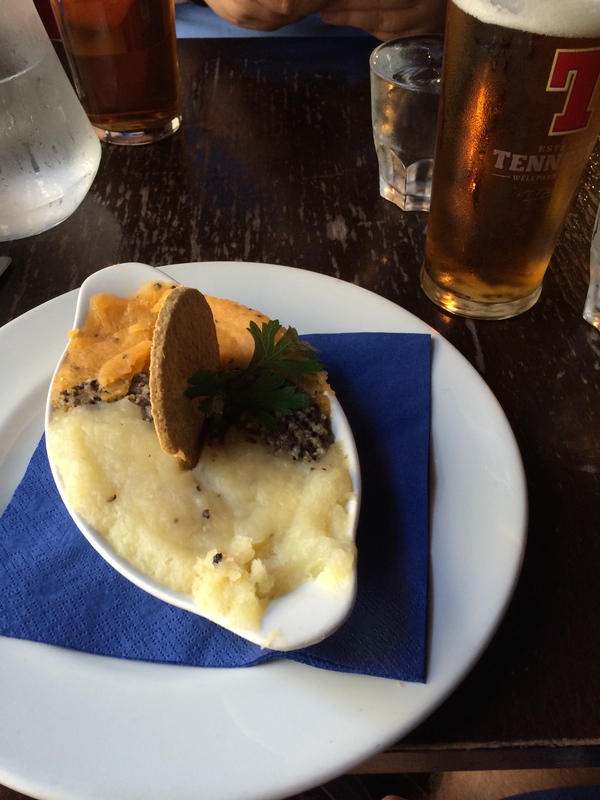 This is, like, the national dish of Scotland. You have to have it. If you don’t know what it is, that’s even better. Just eat it. You’ll like it more. Luckily, the pub offered an appetizer portion so that Ian and I could share that and still have a normal lunch. Tick that box. Haggis consumed. Next. Our last dinner in Scotland was at a very nice Italian restaurant near our flat. We toasted the great week we had in Edinburgh and hoped we would be back soon. Let’s just say we spent our last night in London in style. We had a very memorable stay, a great dinner at one of London’s best steakhouses, and a first-class ride to Heathrow in the morning. It was a great two weeks and I’m more convinced than ever that the best job in the world is being an Aunt. I knew our time in Scotland was coming to an end but we still had plenty to do. 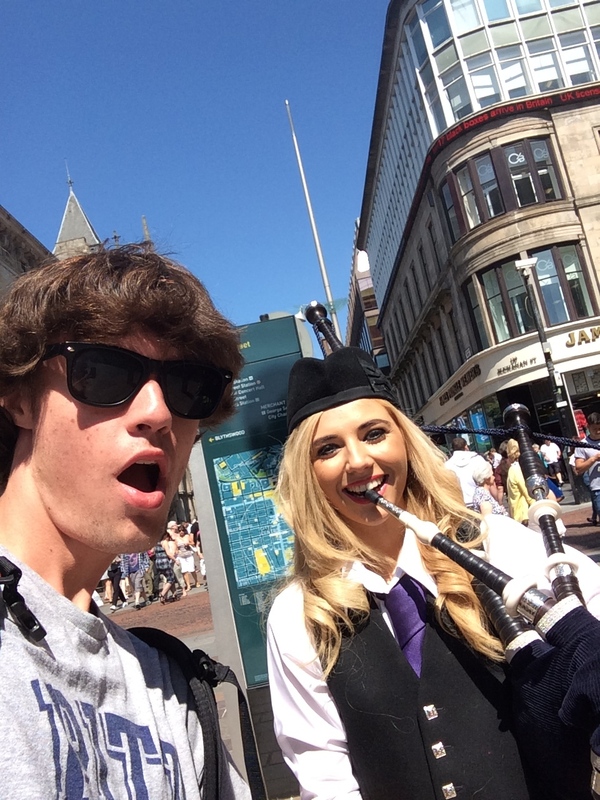 We traveled to Glasgow, which offered a bunch of cool stuff. The Lighthouse provided a great view of Glasgow. We walked down some really cool streets with a bunch of shops and crowds of people. People were street performing, playing music and taking pictures with people in speedos. Of course, I took a picture with them it was a bathing suit company advertising their “Funky Trunks”. We came home and went to dinner, another great meal. Our last day of Edinburgh was awesome. We visited the Holyrood House it was beautiful and I’m pretty sure horseface and the old man have to pay rent. We took a trip to Cadenhead’s to shop for some scotch and that was an experience itself. The man working there was definitely a Scottish hippie. He loved scotch and after a while he wasn’t being such a jerk. His Star Wars analogies were pretty funny. 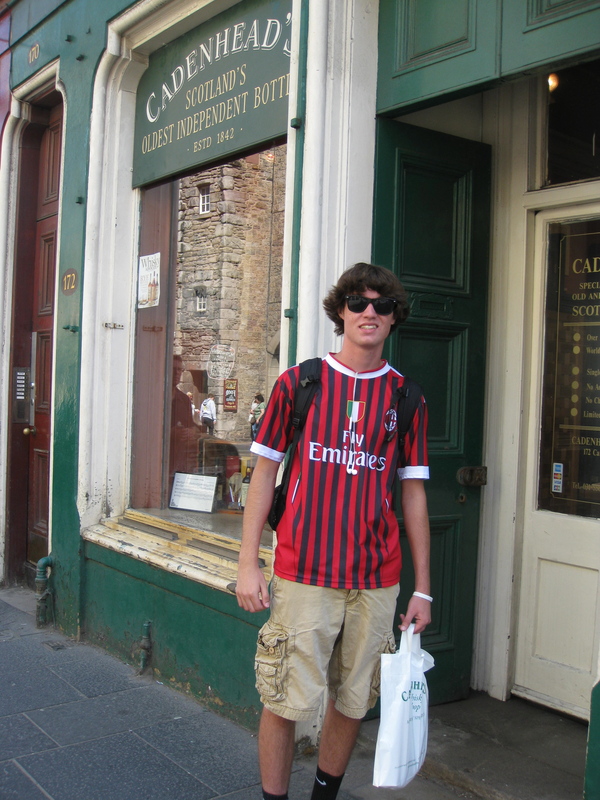 It was a cool shop, supposedly oldest whisky shop in Scotland. The haggis at lunch was actually not that bad definitely an interesting dish. Our last dinner was delicious the perfect way to end Scotland. Our final dinner in London was to a famous steakhouse it was delicious. I have two children and I can’t agree more, the best job in the world is being an aunt! I love you posts Jane! Let’s get a glass of wine after work soon! I need your input on a trip to the AMALFI Coast I’m planning for this September! Kay and I were in that very same whiskey shop, Cadenhead, in 1985. The gent who ran it then urged me to be a mail customer like his friend David Rockefeller and did I know him?